This Portable Camping Toilet Folding Commode Outdoor Emergency Mobile Travel with 16 Plastic Replacement Sanitary Bags from Army Universe is easy to use, easy to set up and easy to clean. Assembly takes less than 2 minutes. Lock the stainless steel durable frame legs into the plastic toilet seat and just wrap the bag and you're set! Other portable camp commode toilets come with 6 or 8 disposable waste liner bags, but ours come with 16 plastic hygiene bags which is double what others are offering! Waste bags that are included are blue and not white which is better because it conceals all urinal waste poop or pee without any issues and don't worry about flushing since this can be tied easily and thrown away. Fold this camp commode toilet potty easily without any issues. Whether you are traveling in your car, camp or on the go, you can take it anywhere since it isn't too large. Keep your campsite clean and never have issues stepping on doodie or pee urine that ruins your shoes and your camping, hiking, outdoor, RV, boating, recreational, travel or more. This porta potty is super durable frame is 250 lbs and heavy duty. Usable by any male, female or even kids! Feel like you are at home with this sanitation toilet seat and carry it easily anywhere you go so you have it when you gotta go! PORTABLE & FOLDABLE COMMODE - Folds Flat For Easy Carrying & Storage. When It Comes To Number 2 - This is #1! We can't control when nature calls, but when it does make sure you are prepared! FEEL COMFORTABLE AND LIKE YOU ARE AT HOME ANYWHERE! COMES WITH 16 REPLACEMENT BAGS FOR WASTE! Plastic sanitary bags are 8 gallon size and holds all pee, poop securely. Fold bag around the entire toilet seat as a seat protector or wrap around the plastic ring to secure the bag in place. HEAVY DUTY 16" TALL FRAME - Durable frame made from stainless steel. Durable white molded plastic toilet seat. This urinal is a perfect waste bucket porta potty for use when on the go. WEIGHT LIMIT: 250 lbs (120 kg). Lightweight 3.2 lbs. makes it easy to pack and carry around. Folds easily and fits into most backpacks like a field toilet would in the military. 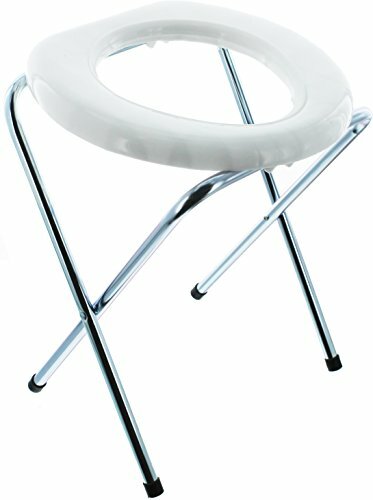 Never have another emergency without this travel camping toilet chair. COMFORTABLE FOR ON THE GO - IDEAL FOR BACKPACKING. Perfect for camping, hiking, trips, construction sites, fishing, hiking, outdoor activities and more! SUITABLE FOR MEN, WOMEN & KIDS OF ALL AGES!